After the previous post featuring my latest FO* and summarizing my First Quarter Plan progress, I was committed to finishing up my Cypress vest before the end of March, and was all set to do so… until I lifted my arms overhead to fold a blanket and my rib popped out of place. Close but no cigar… yet. That sounds far more gruesome than it actually is, but the pain is highly inconvenient. It’s a pretty common occurrence since the lower ribs are flexible (in order to expand and contract with breath) and sometimes the ligaments holding the ribs in place get loose or what have you and POP — one gets out of place. A couple of years ago I had a back spasm for about a week, which is the first time this particular spot gave me trouble, and it popped out again back in November, as well. Sharp pain, discomfort sitting and standing, no lifting possible, and difficulty breathing are the oh-so-fun things I got to experience all day yesterday instead of quality knitting time. Before that point, however, I had managed to knit both wee sleeves and finish them with a tubular bind off. 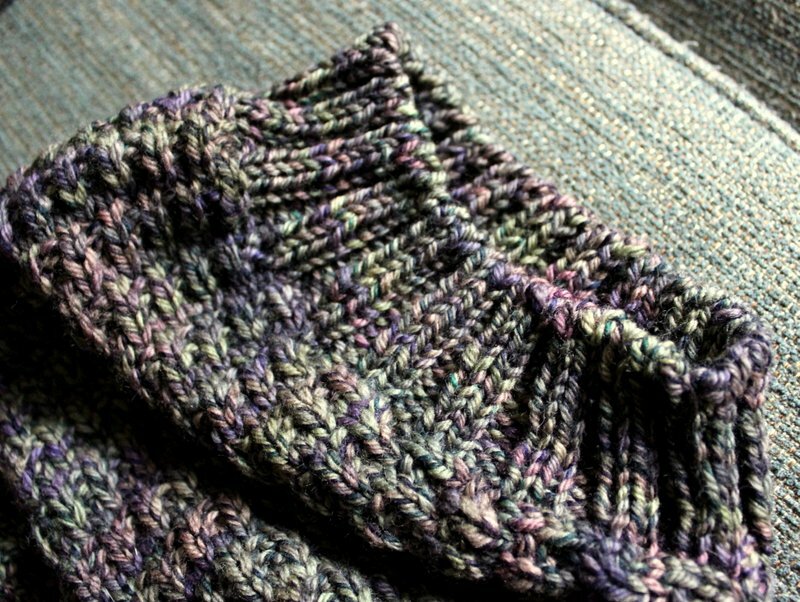 This was my first time doing a tubular bind off and boy was it fiddly but I kind of enjoyed it as I have a strange affection for kitchener stitch. It also looks nice and neat. 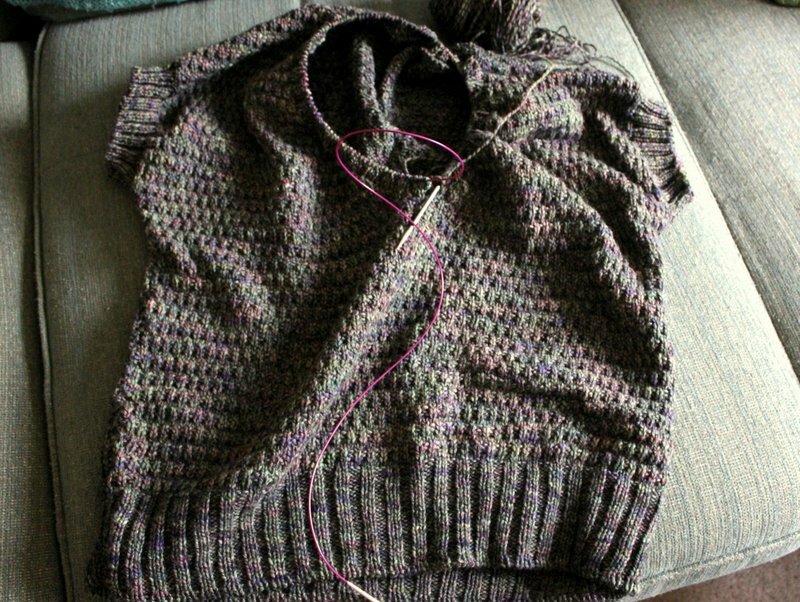 I have just about an inch of knitting left on the neckline before the bindoff and then this vest will be done, done, done. Since my rib/back is currently in the ‘dull ache’ vs the ‘sharp pain’ stage of things, I’m hopeful that I’ll be able to get to it sooner than later. One thing I did manage to do this weekend is update some out of stock Sweet Sheep lotion bar scents, including Crisp Pear, Lemon Cake, Turkish Mocha, Sweet Almond, Champagne Fizz, and Honey Beeswax (a spring-time favorite!). *The socks, btw, do actually fit the Fiasco. His words: “They fit like a glove made for Tyrion Lannister” which means either they’re made of gold, or they’re a tad too snug. But no matter, he’s still wearing them! This entry was posted in BMFA, knitting, sweaters, SweetSheep and tagged bluemoonfiberarts, brooklyntweed, knitting by shoelaceswitcher. Bookmark the permalink. Ha! A glove for Tyrion. Well, hopefully a Fiasco always pays his debts. OUCH! You know it is bad when you can’t knit through the pain. Hope things are back to normal soon! Yikes! A popped-out rib sounds very painful. Still, you’ve gotten a lot of knitting done. I’m glad the socks had a happy ending! At first I thought you were perhaps talking about the ribbing on your UFO! Have you seen a DR? Hope you feel better soon. Oh dear, I am so sorry for you. When I first read the paragraph, I thought you meant that the ribbing on your vest had popped up, that somehow was too short and you thought it needed redoing but in those few seconds of reading it didn’t quite make sense and a reread revealed an actual rib and pain and displacement. I am glad the knitting is ok but I do hope you heal fast. Best wishes. oh my gosh, you poor thing! that must be painful. I hope it heals quickly, and that you are getting lots of rest and relaxation in the meantime!